LOVE IS IN THE AIR GIRLS! If you don’t have a Valentine this year, no worries; I have got you covered! Remember: you don’t need a significant other to have fun this Valentines day. In fact, all you really need are your best pals, some good music, and these DIYs. So gather your friends and some music, and keep reading! Once you’ve gathered these ingredients, preheat your oven to 325 degrees Fahrenheit. 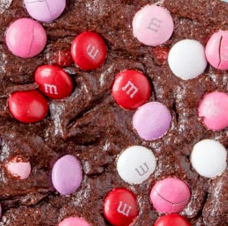 Mix together the egg, water, vegetable oil, and brownie mix before adding in your M&M’s. Make sure you add in the M&M’s little by little, mixing in between adding. Next, pour your mix into a tray and pop the tray into your oven. I recommend setting your timer for about 25 minutes, making your first check-up then. If they still need some time, add 5 minutes before checking again. Continue this process until you get your ideal Lovely Triple Fudge Brownies! them into thin pieces. Once your strawberries are sliced and sweetened, it’s time to get rolling! To begin this masterpiece, slice your angel cake into a piece large enough to fit your bowl. Place this piece at the bottom and cover it in some Cool Whip. 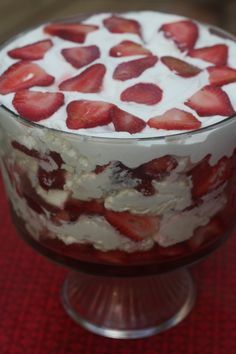 Then, cover the Cool Whip in strawberries and cover those strawberries in some more cool whip. The greatest thing about this recipe is (1) THAT’S LITERALLY ALL YOU HAVE TO DO (2) you can personalize your layers! There’s no rule! And (3) there’s no baking involved! So gather your friends, make some treats, play some good music, have a dance party, and enjoy your Valentines Day with some people who are dear to you! I hope you all have a great celebration!